While technically Dawn of the Planet of The Apes is a perfect movie, it still has its flaws, but, with saying that, it is still an amazing sequel to and should be watched before War For The Planet of The Apes. In 2011, Twentieth Century Fox re-imagined the very popular 1968 -1974 films and television series called The Planet of The Apes. Rise of the Planet of The Apes took a different slant on the classic story and it seemed to pay off. Once again, the subject matter was a hit with audiences so naturally, in 2014, they created a sequel called Dawn of the Planet of The Apes that continued the tale they started 3 years earlier. It's ten years after the ape uprising and Caesar (Andy Serkis; The Lord of the Rings: The Fellowship of the Ring) and his followers live a harmonious existence in the Redwoods of California. They don't know if humans still exist, as many of them were wiped out by what is now known as the Simian flu epidemic. That is until one day they are in the forest and come across a human. Director Matt Reeves (Let Me In, Cloverfield) has produced one of the most technically perfect films to grace the silver screen in a long time. Dawn of the Planet of The Apes has amazing cinematography, strong performances by its cast (Andy Serkis, Jason Clarke, Gary Oldman, Keri Russell), and some of the best motion capture to date. However, to this end, the film just does not connect emotionally. Pacing is a bit of a problem, as well as caring for most characters in the film in contrast to the first one where one felt a strong emotional connection to Caesar and his father figure Will Rodman (James Franco; Pineapple Express). 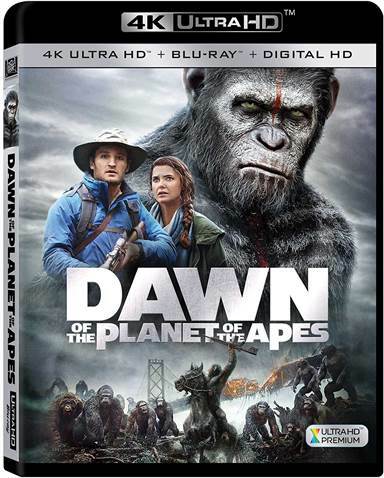 Sporting a 2160p h265 transfer, Dawn of The Planet of The Apes has never looked better! The color, while a bit muted are spot on to what director Matt Reeves envisioned for the film. Blacks are also spot on and true. At no point was there a case of artifcating in the feature length film. Unfortunately, one cannot stay the same of the DTS-HD Master Audio 7.1 audio track as it is the same mix as the Blu-ray release. While this mix is decent in quality, 20th Century Fox could have done so much more if they had upgraded it to Dolby Atmos. Having the same special features as the original Blu-ray release, Dawn of the Planet of The Apes has a nice mixture of features, including seven featurettes, deleted scenes, audio commentary, a still gallery and two trailers. Additionally, there is also a paper insert with a code to watch a preview of War For The Planet of The Apes, which gives viewers a tease of the upcoming film. While technically Dawn of the Planet of The Apes is a perfect movie, it still has its flaws, the pacing is extremely slow and the story isn't as compelling as the first, but, with saying that, it is still an amazing sequel to Rise of the Planet of The Apes, and should be watched before entering the theater in a couple of weeks to see War For The Planet of The Apes. Download Dawn of the Planet of the Apes from the iTunes Store in Digial HD. For more information about Dawn of the Planet of the Apes visit the FlickDirect Movie Database.